Bolt: […] But we’re just trying to get basic facts, without worrying about the consequences – about what those facts may lead people to think. On our own, by cutting our emissions, because it’s a heavy price to pay, by 5 per cent by 2020, what will the world’s temperatures fall by as a consequence? Flannery: Look, it will be a very, very small increment. Bolt: Have you got a number? I mean, there must be some numbers. Flannery: I just need to clarfy in terms of the climate context for you. If we cut emissions today, global temperatures are not likely to drop for about a thousand years. Bolt: […] I’m very familiar with that argument, that if we don’t move, no one else will, and nothing’s done and it all goes to hell in a handbasket. What I’m trying to do is just get to the bottom-line facts: if we spend these umpteen billions on cutting emissions further, to the five per cent by 2020, how much will Australia’s action alone cut the world’s temperature by? That must be measured somewhere. That must be part of your report. Daley: Well, I think it’s not been measured anywhere because it’s not seen as being the right way to think about this. Bolt: Well it would be. People want to know the gain for the pain. Have a guess then. Bolt: Look, we’ve got that argument…. I’ll ask just one last time… If you don’t know just say so, but if you do know, I know it’s got all those caveats, but just tell us how much the world’s temperature will fall if we do what you recommend and what Julia Gillard plans. Daley: As I said, we haven’t run the numbers on how much it will make a difference if Australia acts completely alone. Daley: The reason we haven’t done that is because Australia is not acting alone. Therefore it’s not a very helpful thing to analyse. “Not helpful” means you’d realise the pain is not worth the gain. Whever we do – whatevery anyone does – hardly seems worth it, really. And by “not helpful”, the people pushing the schemes say they’d rather not tell you the truth. You might ask too many awkward questions. That is why no one yet pushing an ETS or a carbon tax will answer our question. And why we drew exactly the same blank a fortnight ago with Jill Duggan, from the European Commission’s emissions trading scheme. It’s all smoke and mirrors, as we’ve known all along. “Perth and Brisbane to run ou of water in 1,000 Yearsl.” – Fairfax press. I guess that’s what happens when you send an imbecile out to do a man’s job. http://www.greatglobalwarmingswindle.co.uk/ watch the film or dvd. This was made 3 to 4 years ago and they were saying then that it take around 800 years or so for carbon to have an effect. Film can be viewed on You Tube. Actually, it’s the other way round, temperature changes result in a change to CO2 concentrations about 800-1000 years later… Changing CO2 is unlikely to affect temperature significantly at all. If the Australian Government is introducing a carbon dioxide tax, in order to penalise people for using it, in the hope of cutting emissions, which will have no apparent effect for about 1,000 years (if any) …. then tell me again why the Australian Government wants to slug the Australian public with an additional tax, for no apparent benefit ???? Am I missing something here – or has the world gone crazy? No, not yet. Bob Brown and Julia Gillard will then set their sights on an Oxygen Tax ………………then it will be the Gillard_Brown’s “Brave New World”……………second thoughts, your right, the world has definitely gone crazy. what he was saying,in between Andrew Bolts simeon-like objections,is that carbon dioxide remains in the atmosphere for an indefinate period of time,at least a hundred years, so obviously if we stop emissions now their will be no change for at least that period. What he did make the point of is reducing emissions now will reduce further warming and avoid the planet becoming another Venus..my 8 year old didnt find it that hard to understand…why do you? trying to establish what the effect on climate will be if australia alone cuts it emissions,just highlights Bolts ignorance.. its like refusing to pay tax because you couldnt build a hospital with your sole contributions…and its a lie to suggest we are going it alone, check out the IPCC website for the National Communications on Climate Change for the actions taken by the 191 countries who have signed the accord. Can’t be bothered to respond to all the nonsense there, except to say that the EU ETS is a total, utter disaster, mired in fraud, corruption and organised crime. Great example for us to follow, right? my 8 year old didnt find it that hard to understand…why do you? Probably because we don’t think like 8 year olds. Adults tend to critically analyse things instead of blindly believing everything they hear without question. When people don’t learn to question they believe anything they’re told. Much like you…..and your 8 year old…. Why are you here? Just go someplace else, like Real Climate. What, peer reviewed papers like these you mean? Of course these papers are not written at the 8 year old level you’re used to; but if you ask nicely one of the grown ups might explain them for you. Totally agree. The fact that it takes 1000 years for temperatures to drop due to an overload of CO2 should be the best recommendation to reduce carbon emissions now. If there’s a sceptic who can explain to me why this is a green flag to continue with escalating Co2 emissions, please enlighten me. Flannery: If we cut emissions today, global temperatures are not likely to drop for about a thousand years. When the “catastrophic man-made global warming” pandemic spread around the world, it clearly adversely affected peoples’ brains and their power of reasoning and common sense. But regarding Flannery’s response to Andrew Bolts, it seems Flannery has become so sick from this disease, I think he actually needs to see a psychiatrist! And to think this man is the chair of Gillard’s Climate Change committee!!!! It’s frightening! So there you go, if every country pulls together our descendants in about 30 generations will finally see global temperatures start to come down. Don’t expect anything good to happen in your lifetime, or the next dozen generations though. The more I read, the more I’m siding with the likes of Andrew Bolt – who we know is an extreme and arrogant ‘climate change denier’. But whether you believe climate change is man-made or not, I agree with Bolt’s argument that doing nothing will ultimately prove more worthwhile than doing something. And our government hasn’t even mentioned the contribution of greenhouse emissions from production of food and agriculture. Shutting down the worlds’ MacDonald’s chains may be just as effective at lowering greenhouse gases and on reducing warming as Gillard’s carbon tax– but what will the masses eat? If the NSW Labor government result is any indication, at the end of the day, the majority of lower to middle class voters were more worried about keeping their coal industry jobs and the rising cost of living, electricity and eating out at MacDonald’s- and they don’t give a rats arse about ‘doing something versus nothing’ when they aren’t likely to see any benefit in their lifetime- just pain. With Bob Brown as our incumbent Prime Minister, it might be popular policy for the major federal parties to pretend to support so called ‘Green Initiatives’ for the greater good of mankind and the planet Earth, but any such government policy will only stand the test of time of the voters , which is realistically limited to their working lifetime and extremely unlikely to last for the next thousand years. If a Carbon tax is passed through parliament, it won’t take long for voters to see how it impacts them directly. I’ll be truly amazed if any one voter will be ‘better off’ as Labor ‘spins’ it. My belief is that there is simply nothing Australia or any other country can do to slow or stop climate change as it is futile. It will be for future generations to determine how to adapt to any changes in climate as and when they impact us directly. Looking after Australia’s living population in a fiscally responsible manner should be the primary role of any incumbent government and it will be interesting to see how long “green” policy survives once it starts to impact core voters. leave it up to the scientists mate…its a bit like seeing a doctor for chest pains, who then send your file to every heart specialist on the planet who all say (without one exception) that you need to give up cheese to lower your cholesterol, and instead you take the advice of a ranting shock jock with a penchant for young boys, whos on the payroll of the cheese factories. That is the most tedious, hackneyed argument out there – the old “you’ve got cancer, who do you trust” routine. Seriously, give us a break. We’ve heard it all before, and it has nothing whatsoever to do with the arguments about climate science. And it’s also the argument from authority – the more people believe something, the more likely it is to be true. Wrong. And don’t start on the “payroll of Big Oil nonsense”. What about Big Green? For every dollar spent on sceptics, $3,500 is spent by panicked governments on climate alarmism. So who’s more likely to be corrupted by the funding, hmm? Yawn. @Duncan – For what it’s worth- I am from another State, but lived previously in NSW for many years so I can say categorically that I do not like or listen to Alan Jones, 2UE or other similar ranting shock jocks of his ilk. Nor do I bother reading trashy tabloid journalism you refer to – so you’re way off the mark. Think ABC (yeah – I pick through the propaganda) , SBS and Nature, Scientific American, etc.. blah blah.. so yeah I read scientific arguments for and against your indelible view. I don’t need scientists to tell me our Sun will go out in roughly another 5 billion years, but you’re argument to ‘leave it up to the scientists’, take heed and take steps to ameliorate the ‘climate change’ now makes about as much sense as preparing for our impending doom when our natural nuclear reactor runs out of fuel. If the scientific evidence is so convincing, why is it that so few countries are bothered to do anything about it? Is it because the science is unconvincing, or is it true but those countries don’t want to commit an act of economic vandalism on their people now when it won’t make any difference to the outcome for at least 1000 years? Yep, typical alarmist name-calling. I abhor ad hominems, but in your case I’ll make an exception. I think we all know who the moron is. 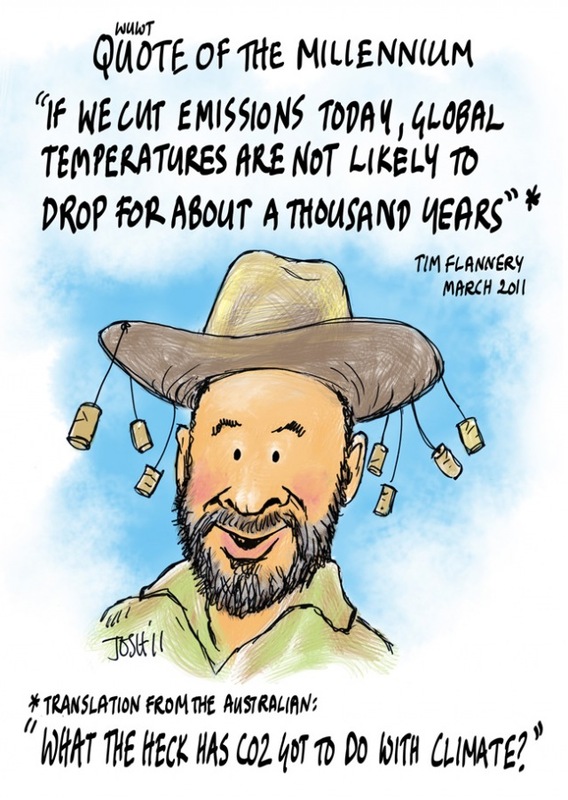 Tim Flannery still just doesn’t get it. Carbon dioxide does not influence atmospheric temperature… it is temperature that influences carbon dioxide levels in the atmosphere. The results of tests on ice-core samples have demonstrated this. What Flannery stated, therefore, is simply crap!